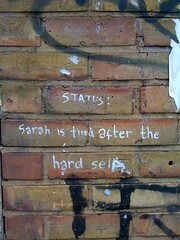 The Fine Art of the Status Update – Writer. Editor. Storyteller. When I was in college AIM was all the rage. “Away Messages” were the “Status Updates” of the early 2000s. I used to get annoyed to no end by people with literal away messages: “In Stats until noon” was awfully boring. I was a fan of song lyrics and cryptic inside jokes. If I was at dinner you could count on, “At the meat market with the Smurf.” The “meat market” was what my roommate (Smurf) and I called our cafeteria, where girls who didn’t even get out of their pajamas to go to class would put on heels and formal wear for dinner. Now that no one uses AIM anymore, Facebook status updates and Tweets have replaced away messages. And I take my status updates very seriously. Either people will get it or they won’t. If they don’t, well, I’ve obviously proven my superior wit and pop-culture knowledge…and hopefully made someone laugh. I always felt that these updates were so inane but you’ve given them a new light. You’re right, it can be a creative expression like anything else. Thanks for the food for thought! Really enjoy your blog, and I’ve awarded it The Versatile Blogger award. Pop over to my blog to see what it’s all about! Thank you, kindly. I’ll be sure to pop over, and, perhaps, give a lengthy acceptance speech.